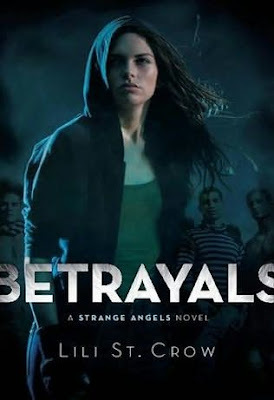 Thanks to Michelle at Michelle's Book Review Blog for sourcing the cover for Betrayals by Lilith Saintcrow (writng as Lili St. Crow). This is the sequel to the young adult urban fantasy Strange Angels that was just released last month. Betrayals is due to hit stores in November. She's no angel . . .
Now Dru is stuck at a secret New England Schola for other teens like her, and there's a big problem - she's the only girl in the place. A school full of cute boys wouldn't be so bad, but Dru's killer instinct says that one of them wants her dead. And with all eyes on her, discovering a traitor within the Order could mean a lot more than social suicide. . .
Can Dru survive long enough to find out who has betrayed her trust - and maybe even her heart? Thanks! Looking forward to book #2! I found Strange Angels to be a so-so read so not sure if I would pick this one up. Loved Strange Angels - can't WAIT for the second book!!! I'll be watching for an ARC of this one, I loved Strange Angels! I think it was edgy and different. I've heard other reviewers thought Dru was whiny, but she is a teenager whose lost everything, right? Thanks for the cover art and blurb intro! Can't wait for this one. I love the cover art. She reminds me of a young Catherine Zeta Jones. Its very twilight-esque. I agree with Dottie. Dru's character didn't strike me as whiny. Rather I thought she was pretty practical. Sure, she had a bad night, the night she had to Shoot HER ZOMBIE DAD! That would make me a little stressed out. And she tried not to make friends; with the life her and her father led, it would feel like a waste of time to make friends. I loved the book, myself. I would love to read the second book. I still have to (and want to) read Strange Angels. It looks like a fun read, so I'm looking forward to this one. Though, I will say that the cover for Strange Angels was a lot better than this one. Well KB second books are often better. I liked the first. Hey Myra at least it is coming out this year not next. Well Dottie Saintcrow's characters tend to have rougher edges than most but I like that about her writing. Rebecca definitely a moody cover. Mardel I actually thought the character was reasonably behaved given her circumstances. PopinFresh I haven't compared models but it doesn't seem to be the same girl. I think the two covers to complement one another though stylistically. Just finished reading Strange Angels and loved it. I'll definitely be lookign out for this one. Oryfan it's on my list too. I like Saintcrow's dark style.